When your company is registered in Indonesia, you are allowed to run a full scale of business operations. By setting up a PT PMA company, foreigners can execute their business in many areas. Indoconsult can help you with registering your company in Indonesia and provide continuous supports with several services, which enable you to successfully operate in Indonesia. While incorporating a company in Indonesia several steps need to be taken to get a full operational business. To get business running and legal operational Indonesian Authorities demand a couple of license. Starting from the principle business license (Izin Prinsip), Import licenses or Land licenses up to the permanent business license. We support you getting the relevant licenses for your business and help you throughout the licensing process with governmental authorities and departments. One way of doing business in Indonesia is the possibility of establishing a representative office. 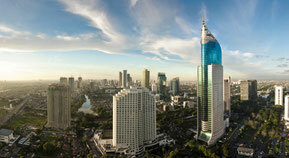 Indonesia offers two different kinds of representative offices for foreign companies. We also support you in purchasing existing companies and help you to get secure transactions and business for your success in Indonesia.